The seasonality of the food and beverage industry is aligned differently than many consumers might expect. Brands are always working to increase user engagement to drive brand loyalty, and this type of strategic planning happens months in advance of each season. Here are some of the products we are excited about hitting the shelves in the first quarter of 2017. In 1992, you’d never seen a taste like this ­was the marketing slogan for Crystal Pepsi. Just a year later, you literally wouldn’t see it again until August of 2016 when the fabled soda returned much to the surprise and overwhelming excitement of consumers everywhere. Its limited-time-only release was so well received it has been released again this month. $15 million in sales in just four weeks in its August debut, it will be fun to see how well the clear soda, sold only in 20oz. bottles does again on the heels of that massive success. The energy drink industry continues to ride the surge of popularity and reliance from their most diehard fans, consumers who appreciate an energy jolt to come from sources other than soda or coffee. Three big brands have new products planned for the first quarter including Rockstar, AMP, and Kickstart. Mtn Dew Kickstart launched four-packs last year and will continue to grow its portfolio by offering Mango Lime and Raspberry Citrus, two new flavors. AMP Energy Tropical Punch will join the brand’s core lineup flavors – Original, Cherry Blast, and Strawberry Limeade. 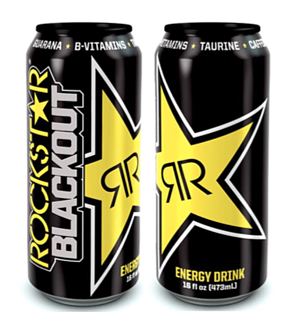 To round out the energy category, Rockstar’s powerful new addition Blackout will get back to the brand’s basics. Full-calorie, high caffeine, traditional energy, and a brighter, sweeter taste to entice even more fans. Quickly gaining popularity is kombucha - a fermented drink made with tea, sugar, yeast, and bacteria. Bacteria? Yes, but the good kind - the kind that people are clamoring for, making kombucha more readily available and on our list for beverages to try this quarter. Do it for your health! Deane's Kombucha is crafted in Minneapolis in five different artisanal flavors including Cherry Basil and Buckwheat Honey. The centuries-old brew is known for many healing and health benefits like immunity boosting, improved digestion, and organ function. 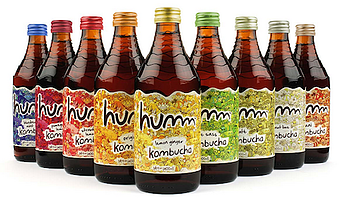 Humm Kombucha from Bend, OR promotes antioxidants, probiotics, and B vitamins in every bottle. As consumers continue to endeavor for cleaner, more natural products to make a habit or special treat, kombucha continues to evolve to meet those needs. The Huffington Post has an entire category dedicated to Kombucha - proof of its popularity and trend amongst today's consumers. Convenience stores offer just that - convenience. But c-stores are quickly becoming destinations for more than fuel. Today's gas stations, restaurants, and other snack centers offer consumers the choice of fresh, healthy foods and premium beverage options including coffee, both hot and cold. While iced coffee, whether bottled or fountain has been readily available in these locations, 2017 will usher in cold brew options similar to popular coffeehouse offerings. 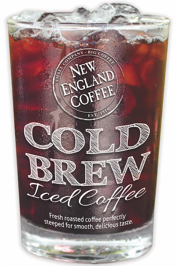 Cold brew is different than iced coffee in how it's made - without hot or boiling water. The coffee is steeped in cold water for about 12 hours, and either "pressed" to remove the grounds from the coffee, or in the case of New England Coffee Cold Brew, the bags of coffee beans are simply removed from the pitcher or dispenser resulting in fresh cold brew coffee, ready for serving. Cold brew is popular and the fastest-growing coffee trend in the U.S. for its convenience and fans appreciate the ease of customizing cold brew to individual preference and its lower acidity than traditionally brewed coffee. While cold brew will make a big splash in 2017, we can't forget about the Green Siren: Starbucks – an eponymous brand with a seeming superhero power. Why? Because the Seattle-based brand has been doing coffee right since its inception in 1971 and has continued to evolve as the world’s most prominent coffee label. No one should be surprised that 2017 has some new releases planned including the first espresso innovation in a decade. A line-up of bold flavors inspired by global coffee styles will be showcased in the Starbucks Doubleshot Espresso line including Cubano and Espresso & Salted Caramel Cream varieties, all available in 6.5oz. single serve cans. The brand is releasing a new flavor of bottled Frappuccino with Dulce de Leche, again with a nod to international flavors. Bottled Frappuccino hit the shelves of retailers in the summer of 1996 – 20 years of flavor innovation and seasonal releases later, the iconic beverage continues to drive loyalty. Cheers to a delicious year of innovation and exciting new beverages. Be sure to visit our A Year in Beer - a 2016 Recap blog to see what is on the horizon for that category in the New Year!